Practical single bevelled blade for craft, workshop and camp. Very beautiful and very practical folding knife, with a single bevelled blade of laminated Aogami #2 Blue Paper steel. 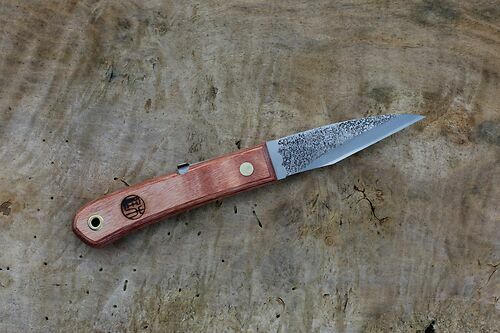 Perfect for arts, crafts, woodworking and camp use, as well as garden jobs and just as a general purpose knife - the single bevel gives incredible precision and the Blue Paper steel holds an amazing edge. Fits in the Single Holster quite nicely.